This is a digital woodcut made from the photo that I posted yesterday. I have had the Painter program for a long time, but only recently have started using it to make digital woodcuts. Today I worked with some of the photos from a mid-January drive into Boston. 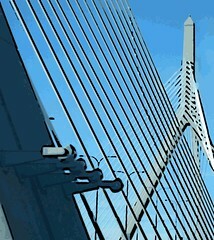 I thought the Zakim Bridge would make a nice woodcut because of its beautiful patterns. I adjusted the heaviness and black line controls till I had the effect I wanted.